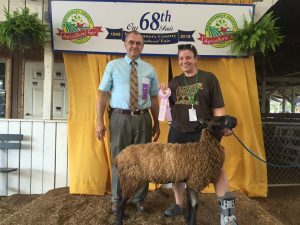 BLU member Meredith Myers Null of BlueLand Farm had a great weekend at the Montgomery county, MD fair. 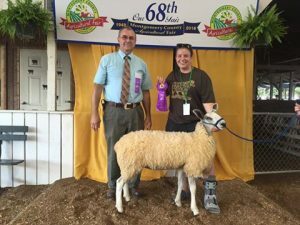 Her white ewe lamb won champion white long wool ewe and she also had reserve champion natural colored long wool ewe.Here they are with Ohio judge Sam Wiford. Looking to purchase some bluefaceleicester. Can you help me.